Thinking about upgrading your lighting package to a LED lekos? OR maybe you are starting from scratch and building from the ground up. Is power a concern? Do you already have some Lekos you want to add to? I will cover all that below, lets get started. LED lekos come in two main categories. LED fixtures that can only produce white light and are colored by gel, and those that offer full color mixing. There are advantages to each, and hopefully I will touch on them just enough to help you make a call on which way to go. Light quality is the driving force behind ETC’s LED product development. Countless hours have gone into creating tools worthy of the most professional applications, and the Source Four® LED Series 2 luminaire is the result of that dedication. With the brightest output and the boldest rendering of the colors you use most, the Source Four LED Series 2 introduces a whole new level of LED lighting that can be used anywhere. If you already have ETC source 4’s in your inventory this would be the fixture for you. Without a dought replacing your current units with these would be the way to go over buying a different brand. These units use all the same lens tubes and accessories. ECT also sells several versions of the LED source 4. 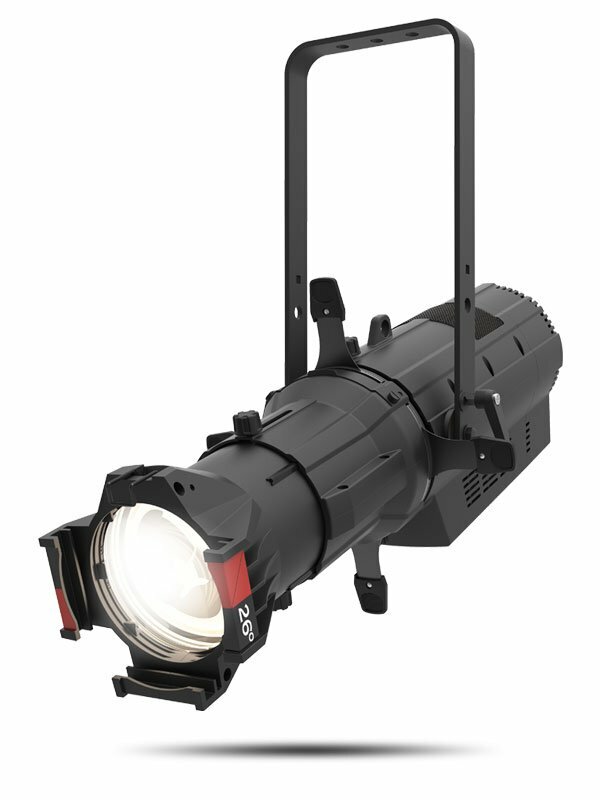 From the top of the line product simply called the Source 4 LED series 2, which is a color changing unit with a 7 led color array to the S4WARD which is a retrofit LED for all existing Source 4’s. 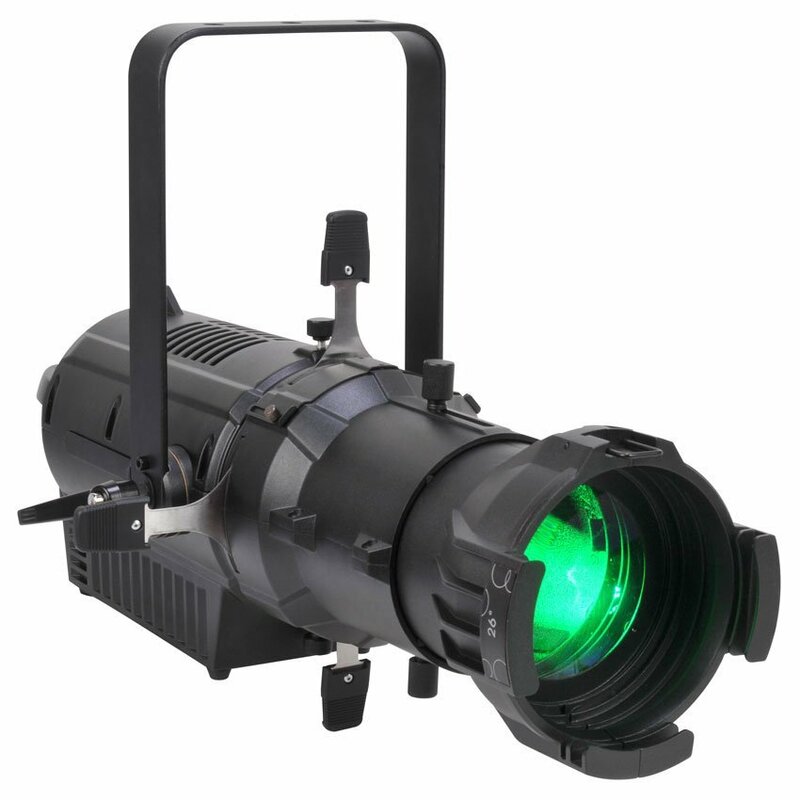 According to Elation the COLOUR 5 Profile™ Ellipsoidal features a 180W RGBAM (Red, Green, Blue, Amber, Mint) LED engine, >94CRI, 4,100 total lumens, with 19°, 26°, 36°, and 50° interchangeable lens options (sold separately), (4) blade manual framing shutters, manual focus, supports B size metal HT transparency gobos, DMX controlled electronic strobe, dimming, and dimming curves, flicker free operation for TV and FILM, adjustable refresh frequency and gamma brightness, 5pin DMX and powerCON in/out connections, (4) button LCD control display panel, an integrated rigging yoke, quiet fan cooling, and a multi-voltage universal auto-switching power supply (100-240v). Sorry, no video available at the time of this writing. Chauvet if you send me one and I will do a review. Its beam is crisp and precise, directing light only where it is intended: thanks to the SPX filter frame system there is zero light leakage, so no additional masking is required. With reduced fan noise, the SPX LED WW is also quieter in operation than comparable LED fixtures. Ideal for applications such as education, houses of worship and themed environments. The SPX LED WW uses the same proven, high-precision, high-performance gate and lens sets as the renowned Selecon SPX Profile fixtures, with secure locking shutters, while other lens sets can be used with the universal lens tube adapter. With the ability to be dimmed either via DMX or from a conventional forward phase dimmer, the SPX LED WW provides a smooth, stepless fade right down to zero, giving it the perfect dimming credentials for performance lighting. Again no video, how will we ever see the product. Come on strand send us a demo. If you made it this far it is probably because you don’t have many Lekos. If you do the choice is most likely already made for you. Buying any of these units with out the lenses is much less expensive. If you already have lenses from one one brand or another you are going to probably stick with it. If you are really open to going a new directions there are a few things to think about. First LED units are a lot more expensive. A lot of what we do for churches is light the pastor. 99% of the time in white. Lights doing that job don’t need to be able to change colors. Those you want to be constant. You want to be able to lock them down both in regarding position and intensity, but also with color. While is is great that some of these LED units can do any color that comes at a cost. First, over time LED’s do burn in and give up intensity over time. This could lead to your white not looking white very long. Also they change colors as they dim. Most manufactures have worked very hard to make LED’s look like incandescents when they dim. Which means adding in more red as the light dims. There are uses for each and every one of these fixtures. If I was buying new LED fixtures I would be buying the majority of them with a fixed white and color the light with GEL if I needed to. A few places I can see the need for color changing Lekos, but I mostly use them for front light, so for me it would not be widely used. Also depending on the desk you are using it maybe easier to gel the fixture to get the correct color temperature than to use the onboard desk presets. No telling how accurate they are. I hope this helps. Please leave your comments below. Tell me what you have in your church. What types of lights you really need? What is the cost to maintain the lights? What type of light do you need? You may not need LED or intelligent lighting to get the job done. 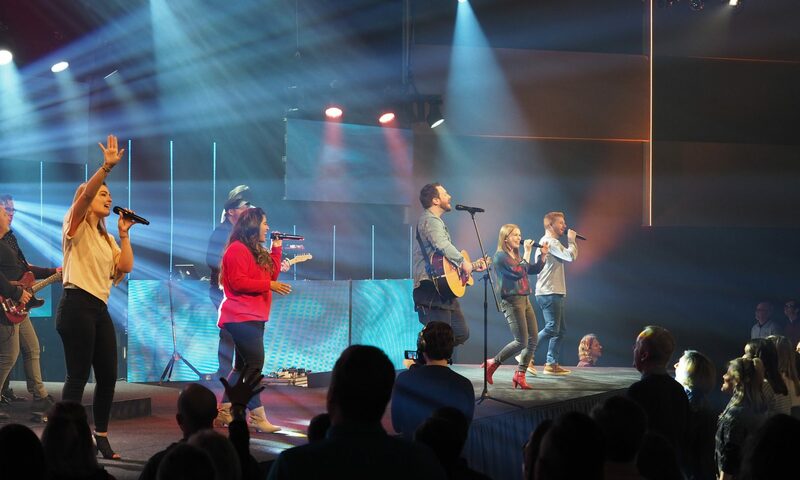 I can argue that conventional lighting is 90% of what a church needs to get there message across. Or at least that is where you should start. If you don’t already have 40-60 conventional lights I would argue that you are not ready to jump into more automated rigs. I say this for a few reasons. 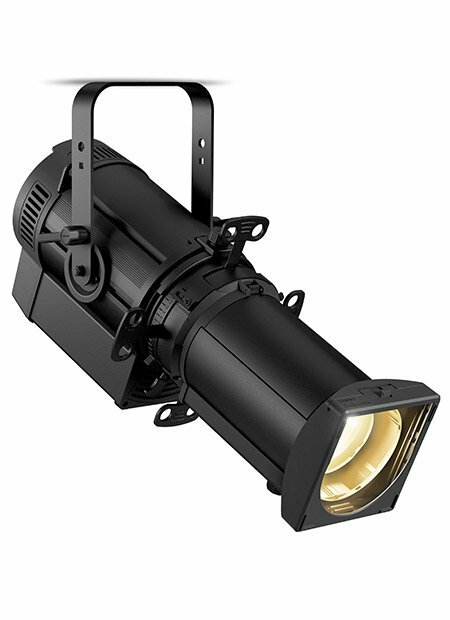 First, LED fixtures and automated lights are often 5-10 times more expensive than a par can or ellipsoidal. 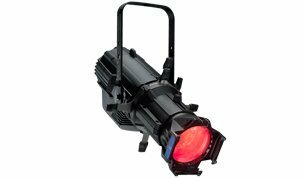 Any lights source that is repeatedly used as a front wash for a pastor or singer key light should just be a par or ellipsoidal. 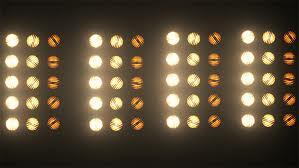 Only the constantly changing key light and effects lights should be automated. Second, it is unlikely that you are going to buy enough LED’s or moving lights to really do anything interesting. 4 or 6 lights is not really interesting unless your stage is about 10 feet wide. Just think about the coolest lighting looks you have seen. Count the fixtures. I bet it is 20-30 maybe 50-60 in the scene. Third, LED’s and automated lights introduce a huge conflict in color temperature that you need to handle for the camera. Which is a huge pain and unless you are buying really expensive LED units they don’t look great on people’s faces. Forth, the cost of a lighting desk to handle automated lights vs conventional lights is 5-10 time more expensive. And 10 times more work to program these lights. For the money, conventional lighting is going to take you further, last longer, and be much more stable. Conventional lights done well are by far the easiest thing to do in the long run. The only thing to worry about is changing lamps and gel repointing fixtures every once in a while. Which is not a big deal because you should be planing a way to maintain any light you purchase. Maintenance, what is that? Yep, you are going to need to pay attention to your lights. No matter what you buy you need to be able to get to them to work on them. Changing the lamp, cleaning the lenses, or getting them repaired should be considered before purchase. Plan to work on the lights. If that means renting a lift or scaffolding, you need to budget that cost into the maintenance plan. Expect to touch each light once or twice a year. Speaking of lamps, Automated lights are great, but the need new lamps as well. Those lamps can cost up to $250 each and only have an expected life of 2000 hours. That is a high price to pay compared to conventional lamps that are $16 each. And what happens when the inexpensive LED pars burn out. Typically you will only lose one or two LED’s but you can’t fix that. So you just end up throwing them away. What is more expensive a $200 light you replace every 2 year or a $600 light that last 10. Sometimes buying more expensive fixtures is cheaper in the end. It is almost certain that the lights you are thinking about buying right now are not the only lights you are ever going to buy. So let’s take a moment and figure out how they will fit into a larger system. Some times we look to buy the light we need right now and don’t think about how that light could be reused down the road. I am sure that your church will not throw the light away when the current design changes, so what makes a light able to be used in many roles. First, we should consider weight and power. With newer LED fixtures coming on the market the weight has come way down. It is still something you have to consider when hanging the fixture overhead. Also, some of the fixtures like LED pixel tape need special power requirements which may be limiting. Larger moving lights require 208 or 220 volts of power. If you don’t already have these different voltages widely distributed you may want to stick with 120-volt fixtures. Second, while wash lights are less expensive, all they do is a wash the can’t project gobos or do aerial effects. But on the other hand spot or profile fixtures can project gobos and when frosted out they make a great wash fixture. Personally, I would always spend the money to get a spot or profile fixture even if you use them as a wash from time to time. For a small upfront cost you basically get two fixtures. Third, we should consider a fixtures zoom and output. When buying a fixture for a specific look you will probably make sure that the fixtures have enough output and the correct beam angle for that look. But what if you move it to a new location? Because of that you always want to buy fixtures with a zoom or easily changeable lenses. Otherwise, you will be stuck with a very limiting fixture. I connect output with the zoom because when you zoom out the fixture you give up output. So you want to always buy more output than you think you need. Dimming a fixture is possible, but doubling the output is not. Lastly, but popular fixtures. Buying fixtures that everyone else has and that you can find locally for rent. If you have a fixture go down or want to rent more for a special event it pays to have a local vendor with the same type. It makes swapping out or adding to your show a lot simpler. Buying used fixtures is fine, you don’t want to buy a model that has been in the market for more than a few years. Especially in the automated department. If you are buying a new type of fixture to add to you inventory it would pay off to buy the latest and greatest even if it cost a little more. Those fixtures will be available for longer in the market place and have better tech support if anything goes wrong. Just like Vince Lombardi would introduce a football to his players at the start of every season we are going to start with the most basic of basic lighting related topics. Plugs! or Connectors. Stagepin, Edison, Powercon, twistlock, camlock, True1, and many others. Which connectors you are using and why is very important. Nothing runs without power, let’s get started by makeing sure we know how and when to use each plug. Since we are dealing with electricity please make sure you call in an electrician if you are uncomfortable with this topic. 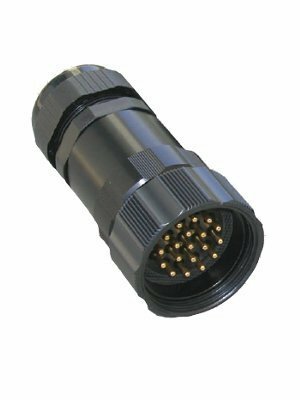 Each type of connector has very specific uses and limitations which you should consider before using. As we will see in a moment there is not one connector or plug you can use in all applications. 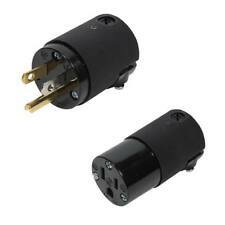 But by using the correct plugs you will greatly reduce the risk of shock. Let us look at each type. The good old Edison plugs. Everyone in the United States has used one of these. It is the most common plug we have in this country. And I assume the most widely thought of power source at any church. The Edison plug is fine for a lot of things, but one thing to watch out for is the amp rating. 9 times out of 10 the Edison connector for sale it will be a 15 amp variety. I tried to find one to link to on Amazon but I don’t see any that are 20amp. This is ok except for building jumpers or stingers. (extension cords) The power rating of most breakers is 20 amps, it is important to keep everything in line rated at 20 amps. That means all cable and connectors need to be fully rated at 20 amps. Also, Edison plugs get really loose over time and have a tendency to disconnect easily. If you need to keep connectors together the locking twist lock is a great connector. 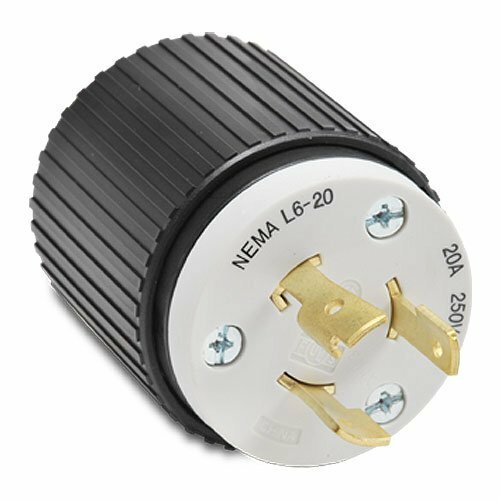 These come in several varieties and it is important to make sure that you are buying the correct model for the amperage and voltage required for the circuit. These are very common with touring lighting companies that don’t want to deal with cables coming apart in the truss. The most common types are L620 and L520. These are used for 120 volt and 240 volt respectively. 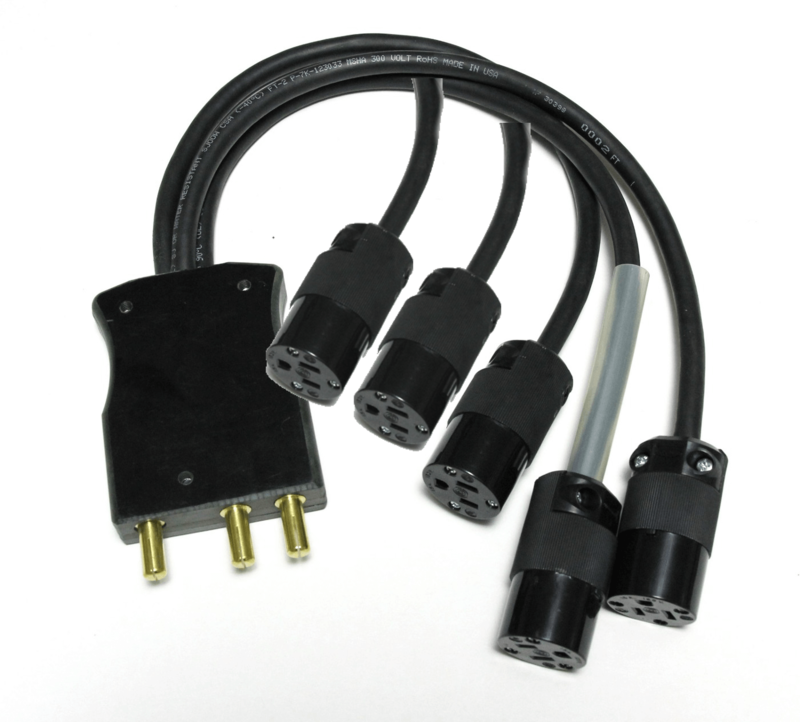 Powercon and True1 are both very common connectors. 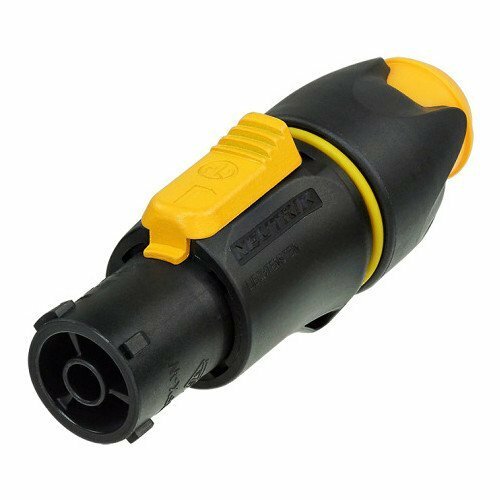 They are both made by Neutrik who is a leader in the connector industry. The True1 connector was developed as a replacement to the Powercon connector. Powercon is very popular. Powercon does have a small problem with what is called breaking capacity. Which means that technically you should not plug or unplug a Powercon under load. You are required to turn the power off at the other end before you can disconnect the Powercon from the fixture. This is actually really dangerous and bad for the fixtures. Which is why the True1 connector was created. 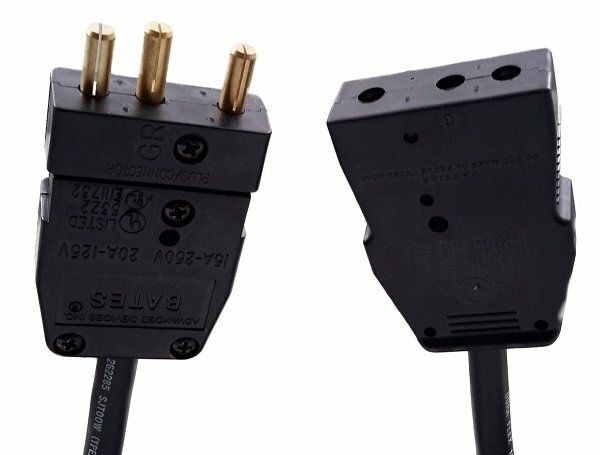 True1 is a replacement for the Powercon but it does have breaking capacity which it needs to be a safe connector. 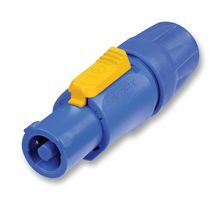 Socopex is a great connector which is very widely used when multiple circuits are needed. Soco can run 6 circuits of power or dimming. Each end can be fitted with a fan out or into a panel mount. Great way to send lots of power. In summary, there is not one plug you can use in all situations. But keeping things consistent will help greatly whenever you go to change your design. Planning in advance to keep everything to one or two connectors is really helpful in those pressure cooker weeks right before Easter and Christmas. Knowing what connectors you use and having extras on hand going into these weeks is really helpful.